ASPS is one of more than 50 kinds of sarcoma. 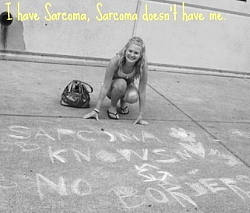 Each kind is rare, yet all together sarcomas affect hundreds of thousands of people around the world. 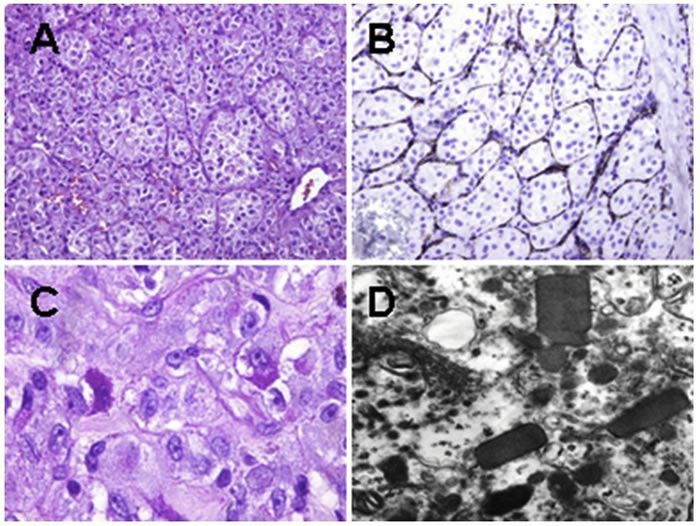 Alveolar soft part sarcoma (ASPS) is a rare, poor prognosis neoplasm of unknown histogenesis with a distinctive histology, specific molecular characteristics, and unique clinical behaviors. ASPS generally develop in younger patients. Unlike other soft tissue sarcomas, ASPS also metastasizes to the brain. While surgery can improve outcomes even in the setting of metastatic disease, traditional chemotherapeutic agents and ⁄or radiotherapy have failed to demonstrate significant survival advantages. This article provides an overview of the clinical manifestations, diagnosis, radiographic features, and treatment of ASPS. Alveolar soft part sarcoma (ASPS) is a distinct histologic soft tissue sarcoma subtype.1 ASPS is an uncommon tumor, typically occurring in adolescent and younger adult patients. It accounts for 0.5 to 1% of all soft tissue sarcomas. Despite a relatively indolent tumor growth pattern, up to 79% of the patients develop metastatic disease with a high proportion being resistant to conventional chemotherapeutic regimens. The development of therapeutically resistant metastasis contributes to increased mortality. ASPS usually presents as a soft, painless, slow-growing mass that rarely causes functional impairment. In adults, the lower extremities are the most common location for this lesion, although it has been described in a variety of locations including the female genital tract, mediastinum, breast, urinary bladder, gastrointestinal tract, and bone.9-11 In children, ASPS most often occurs in the head and neck region.9, 10 These tumors are extremely vascular, and occasionally present as a pulsatile mass with an associated bruit. Diagnosis of ASPS requires clinicians from different specialties, such as radiologists (a physician who has specialized training in obtaining and interpreting medical images), pathologists (a physician who interprets and diagnoses the changes caused by disease in tissues and body fluids), surgeon oncologists (a physician that deals with the surgical treatment of cancer), and medical oncologists (a physician who uses chemotherapy to treat cancer). Figure 2 is a CT scan of a 50 year-old gentleman with a 10 cm diameter ASPS arising from the anterior lower chest wall. The tumor in the image demonstrates a vascular periphery surrounding a core of central necrosis. Tumor size usually ranges between 3 and 8 cm, but cases of ASPS up to 20 cm have been reported. Macroscopically, the tumor tissue is pale gray or yellowish in color and has a soft consistency (Figure 3). Areas of necrosis and hemorrhage are common in larger lesions. Histologic examination reveals ASPS tumors to be composed of well-defined nests of cells separated by delicate fibrovascular septae (Figure 4A). Within these nests there is a prominent lack of cellular cohesion, accounting for the distinctive pseudoalveolar pattern for which this disease is named.19 A variant of ASPS is observed in young patients with lingual ASPS, which has focal prevalence of solid ‘non-alveolar’ growth pattern, without the typical cellular discohesion that is observed in non-lingual ASPS.20 Intravascular extension is present at the periphery of the tumor in almost all cases, and may account for the high rate of metastasis observed in ASPS (Figure 4B). The cells frequently contain eosinophilic crystalline or rod-shaped inclusions which are faintly visible in hematoxylin-eosin-stained tissue sections. On periodic acid-Schiff (PAS) stains, intracytoplasmic glycogen and characteristic PAS-positive, diastase-resistant rhomboid or rod-shaped crystals may be present (Figure 4C, D). Typical crystalline material is seen in at least 80% of cases, and PAS-positive granules are present in almost all tumors. 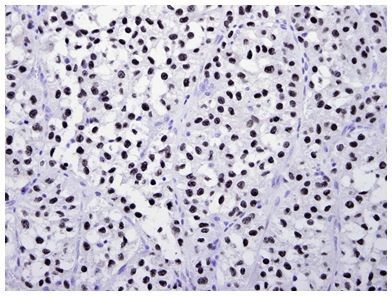 It has been shown that the crystalline cytoplasmic granules of ASPS contain monocarboxylate transporter 1 and CD147. Ultrastructurally, ASPS cells have numerous mitochondria, a prominent smooth endoplasmic reticulum, glycogen, and a well-developed Golgi apparatus. Another characteristic ultrastructural feature of ASPS is the membrane bound or free rhomboid, rod-shaped crystals consisting of rigid fibrils (Figure 4D). These tumors also express desmin, an intermediate filament. It has been shown that approximately 50 percent of tumors express desmin.9 It is important to emphasize that desmin expression can be seen in a wide variety of other lesions such as melanoma, Ewing’s sarcoma and angiomatoid malignant fibrous histiocytoma, among others. ASPS is characterized by a tumor-specific translocation: der(17)t(X;17)(p11;25). This translocation causes the fusion of the transcription factor TEF3 located on Xp11.22 with a novel gene at 17q25, named ASPL, also known as ASPSCR1 (Figure 5). Panel A: Non-reciprocal fusion events are uncommon in most sarcomas, but predominate in ASPS as illustrated in the (A; upper right). Exons 3-8 or 4-8: The breakpoint in ASPSCR1 (17q25; blue), previously termed ASPL, is invariant. This results in type 1 and type 2 fusion transcripts as depicted. Type 2 contains the activation domain of TFE3 while type 1 does not, but both form novel transcription factors incorporating the DNA binding domain of TFE3 with the activation domain of ASPSCR1 and are functional. Differences in function of the protein or clinical outcomes are not described; type 1 fusion events may be more common than type 2, but only a small number of cases are reported. This characteristic translocation between chromosomes X and 17 results in a functional transcription factor with altered target gene activation, implicating transcriptional deregulation in the pathogenesis of this tumor.23 The translocation creates a novel ASPL-TFE3 fusion protein that appears to act as an aberrant transcription factor, inducing unregulated transcription of TFE3-regulated genes. It has been demonstrated that tumors having the ASPL-TFE3 translocation express TFE3 (Figure 6).24 As a consequence, detection of TFE3 nuclear expression is useful in establishing the diagnosis of ASPS. In our institution, patients with metastatic ASPS are evaluated individually. Due to the resistance of ASPS to conventional chemotherapy, we propose to observe these patients or to consider the enrollment in clinical trials using novel therapies as potential treatment. As has been previously reported, few patients who subsequently developed lung metastases treated by metastasectomy (with or without radiation) had an increase in median survival as compared to those not treated by excision (218 months versus 63.5 months).10 However, since this observation was based on small numbers of patients, further verification of this finding is required. Salvati et al. reported a study including three ASPS patients who underwent surgical removal of ASPS brain metastases followed by radiotherapy and/or chemotherapy. 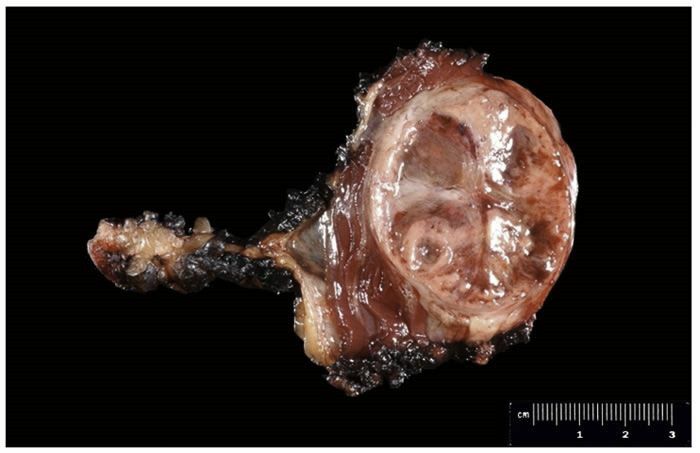 Of the three patients with ASPS, two patients were alive at 15 and 20 months, whereas the third patient was alive at 24 month follow-up.29 Due to the limited number of patients, it is challenging to make a conclusive statement regarding the role of resection of ASPS brain metastasis. We consider metastasectomy in those patients that have good performance status and operable tumors that can be resected completely with acceptable morbidity. While surgery may improve outcomes even in the setting of metastatic disease, traditional chemotherapeutic agents and ⁄or radiotherapy have failed to confer significant survival advantages.30, 31 Chemotherapeutic regimens used for the treatment of other soft tissue sarcomas generally lack efficacy in ASPS. Recently, systemic cancer therapeutics have focused on utilization of molecularly targeted treatments rather than, or in addition to, non-specific cytotoxic agents. This change in medical management has prompted the search for and identification of commonly expressed deregulated targets amenable to pharmaceutical inhibition. For example, we have evaluated the expression of potential targets in ASPS utilizing a focused ASPS tissue microarray.32 Equipped with this unique bioresource, we have demonstrated that the c-Met receptor and its downstream effectors (e.g., AKT and ERK) are activated in ASPS. 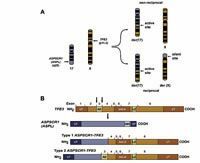 The gene that encodes for c-Met receptor (MET) was recently identified as an ASPL–TFE3 transcriptional target,33 This gene is up-regulated by TFE3, resulting in the increased production of c-Met protein. 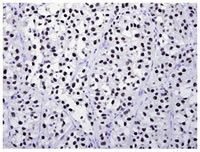 Activation of the c-Met receptor and downstream signaling has been shown to promote angiogenesis (growth of blood vessels), proliferation, survival, cell motility and invasiveness in tumor cells, and might contribute to the malignant progression in ASPS. Therefore, evaluation of c-Met warrants further attention. c-Met is a tyrosine kinase receptor. Both c-Met and its ligand, hepatocyte growth factor (HGF), are each required for normal mammalian development and have been shown to be particularly important in cell migration, morphogenic differentiation, and organization of three-dimensional tubular structures as well as cell growth and angiogenesis. Both c-Met and HGF have been shown to be deregulated in a number of major human cancers. New drugs targeted against c-Met and HGF are currently being investigated in vitro and in vivo, with promising results. These drugs function at a variety of steps including c-Met expression at the RNA or protein level, the ligand-receptor interaction, and tyrosine kinase function. A Phase II clinical trial evaluated the use of ARQ 197, a novel c-Met inhibitor, for the treatment of ASPS patients. Preliminary data of this trial was presented at ASCO 2009, indicating that a total of 28 patients—of whom 17 had ASPS—were treated with ARQ 197. Fifteen patients with ASPS demonstrated stable disease for durations up to 29+ weeks. An overall response rate of 5% and a disease control rate (CR+PR+SD) of 80% were demonstrated among 20 patients who were evaluable for efficacy. Furthermore, activation of ERK and AKT pathways might also occur as a result of stimulation by factors other than activated c-Met receptor. Currently, a Phase II study is being conducted to evaluate the use of KRX-0401 (perifosine), an AKT inhibitor, in ASPS patients. Due to the prominent vascularity of ASPS, we examined the expression of proangiogenic genes via angiogenesis oligomicroarrays,28 demonstrating that eighteen angiogenesis-related genes could be identified as up-regulated in ASPS. Complementary to these findings, several groups have demonstrated the feasibility of using an antiangiogenic approach in the treatment of ASPS using in vivo preclinical ASPS models34,35 to assess antiangiogenic approaches such as bevacizumab. Moreover, Cediranib (AZD2171), a VEGF/KIT tyrosine kinase inhibitor that blocks the elaboration of new blood vessels, has recently been identified as having antitumor activity in early phase clinical trials that included some ASPS patients; a Phase II study evaluating the use of Cediranib for the treatment of patients with ASPS is currently active but no longer accruing patients. Another approach recently receiving attention is the use of tyrosine receptor inhibitors where the underlying rationale is based on the high levels of activated tyrosine kinase receptors (TKR) such as PDGFR, EGFR, MET family and RET observed in ASPS.36 In a study of five cases, four patients with advanced ASPS were treated with sunitinib malate, a tyrosine kinase receptor inhibitor with direct antitumor and antiangiogenic activity targeting PDGFR, KIT, FTL3, VEGFR and RET.36 Among the four patients who were evaluated for response, two patients showed partial response, one patient had stable disease, whereas the other progressed. Although this data is very preliminary, the observations are promising and suggest some effectiveness of sunitinib malate in ASPS. Several reports have demonstrated the potential use of TKR inhibitors such as Nexavar (Sorafenib) in ASPS patients. Although ASPS may spread to a remarkable variety of tissues, the lung remains the principal site requiring surveillance. 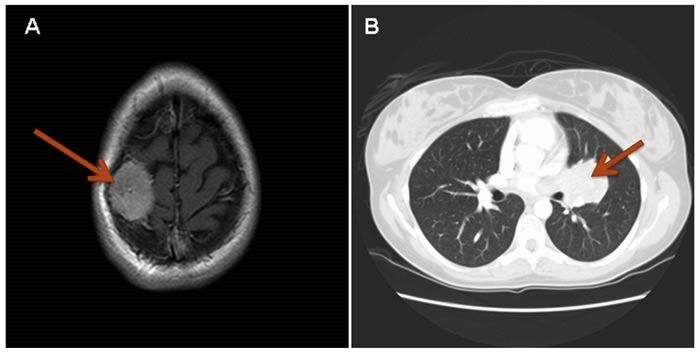 Surveillance should consist of a history and physical exam performed by a clinician, and chest imaging.38 There is little evidence to support a recommendation for routine intracranial imaging in patients who present with ASPS.11 Intracranial imaging should be considered when pulmonary metastases are documented or if neurologic symptoms are present. Long-term survival is possible even with metastatic disease. Whether the favorable outcome of metastasectomy in a small number of patients with ASPS is due to the surgical therapy or due to the indolent nature of the disease is undetermined. Therefore, it is difficult to comment on the role of surgery in patients with isolated metastatic ASPS. We recommend to evaluate patients with metastatic ASPS individually, and to consider metastasectomy for patients with good performance status and medically operable tumors who have M1 disease that can be resected completely with acceptable morbidity. In summary, the descriptive term ‘alveolar soft part sarcoma’ refers to a rare soft tissue sarcoma histologic subtype that typically occurs in young patients. It is characterized by a distinctive histological appearance and a specific molecular genetic abnormality; the prognosis is poor. 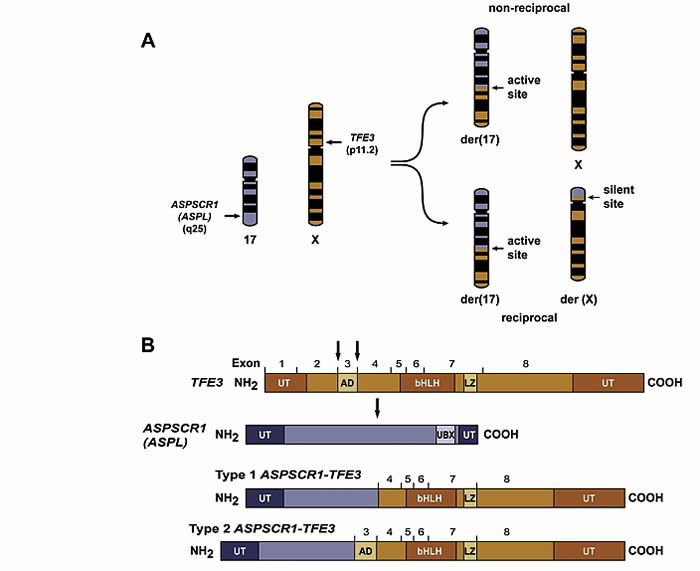 Identification of a specific ASPS chromosomal translocation not only has provided critical information about the pathogenesis of this disease but also has led to rational molecular targeted therapy evaluation. Most series reported in the literature suggest that ASPS chemosensitivity is modest, providing a compelling rationale underlying a major role for surgery in localized disease. The occurrence of distant metastases is quite common in ASPS; however, even the largest currently published ASPS clinical series10,11 does not define the optimal treatment for metastatic ASPS disease. On the basis of our experience,11 the benefit of routine systemic chemotherapy on patients with metastatic disease is uncertain. However, current treatment recommendations are based on very limited clinical information. In the meantime, new molecular targeted therapies, such as antiangiogenic approaches and tyrosine kinase inhibitors, comprise the most promising new approaches for the treatment of ASPS, a devastating tumor which unfortunately seems to emerge in patients who otherwise would be just on the cusp of normal adult life. V7N6 ESUN Copyright © 2010 Liddy Shriver Sarcoma Initiative. We would like to fill this page with survival stories that offer hope and encouragement to everyone learning about alveolar soft part sarcoma. Please consider sharing your story. The iCureASPS Support Forum: iCureASPS aims to bring together Alveolar Soft Part Sarcoma (ASPS) patients, their families and friends who have a shared interest in finding a cure for ASPS. Using the online Forum, members can share their experiences and get information and group support from the ASPS community all over the world. The information network generated through patients' communication helps to collect valuable information about this very rare disease and is a key to the success of finding the best available treatments and ultimately to finding a cure. The Team Sarcoma Facebook Group: The Team Sarcoma Facebook group provides an opportunity to exchange messages with others who are dealing with all kinds of sarcomas, including ASPS. Figure 1. A: CT scan of the head of a 26 year-old female with alveolar soft part sarcoma metastatic to right parietal calvarium with subgaleal and epidural extension (red arrow). B: Same patient with a left hilar metastatic mass growing into the left atrium through the superior pulmonary vein (red arrow). Figure 2. CT scan of a 50-year-old gentleman with a large alveolar soft-part sarcoma arising from the anterior lower chest wall (red arrow). 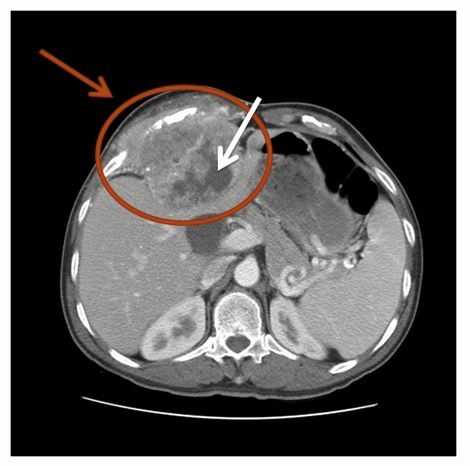 The tumor in the image demonstrates a vascular periphery surrounding a core of central necrosis (white arrow). Figure 3. Cross-section from a resected primary ASPS tumor from the right thigh reveals a well-circumscribed mass with focal areas of hemorrhage. Figure 4. A: Hematoxylin-eosin staining of a case of ASPS consisting well-defined nests of cells. B: Immunohistochemistry for CD31 illustrating tumor-associated capillaries. C: PAS-positive granules. D: Electron micrograph, showing intracytoplasmic crystals. Figure 5. Alveolar Soft Part Sarcoma (ASPS) Translocation. The translocation between chromosome 17 (blue) and X (orange) characteristic of ASPS is seen in panel A. In the exonic gene diagrams (B), the TFE3 gene (Xp11.2; orange) contributes either exons 3-8 or 4-8. Abbreviations: UT, untranslated region; AD, activation domain; bHLH, basic helix-loop-helix domain; UBX, UBX homology domain; LZ, leucine zipper domain. Figure 6. An ASPS demonstrating uniform and strong nuclear reactivity for TFE3, confirming the presence of an ASPL-TFE3 fusion protein.